In Canada we enjoy four seasons, namely, summer, spring, winter and fall. 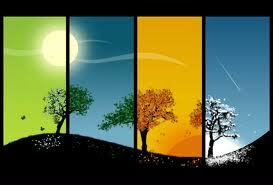 Each season represents changes that we are accustomed already. We even have four sets of clothing for each season. While they always come on time, however, their impact is quite unpredictable at times. But no matter what the season may bring us, remember that life must keep on moving as always. Somebody said, “Some people will change when they see the light. Others change only when they feel the heat.” I believe that when we see the light from God’s perspective, we can effectively handle every experience, whether good or bad, as companions to make us better. Moreover, when God is in full control of your life, everything around us and in us happens for a reason, although we may never know the reason at the time it came. But the most important thing is to comprehend its value for our growth and development. Looking at each description, where do you see yourself? How do you usually respond to changes? Do you begin from #1 and eventually reach #3 after you fully understood the changes? Or get stuck at either # 1 or # 2 and never reach #3? There are reasons why people respond to changes differently. Most of the time, they see changes and it doesn’t make sense why it is done and there are times that changes are done just because of a personal agenda. But when God is at work, the changes He intends will always benefit us even when they don’t make sense. Here is something for us to think about: if Abraham did not accept and follow God’s prescribed changes for his life and Sarah, he would have missed God’s promise and stayed at Ur as an ordinary man. But because he obeyed God and embraced the changes, Abraham became a great man and was confident of God’s promise in all the seasons of his life. You will find that Abraham’s life was not perfect; there were many struggles yet he was greatly assured of God’s promises. He simply persevered and stayed faithful to God’s agenda for his life until to his last breath. Thus, whenever you are feeling down as you go through a tough season, remember that when God is on your side, everything works together for good. He will never leave us nor forsake us in every season and whatever changes may come our way, whether favorable or unfavorable, at the end of it all we will always become better. I fully believe that if God is at work in my life, He is also at work in your life.